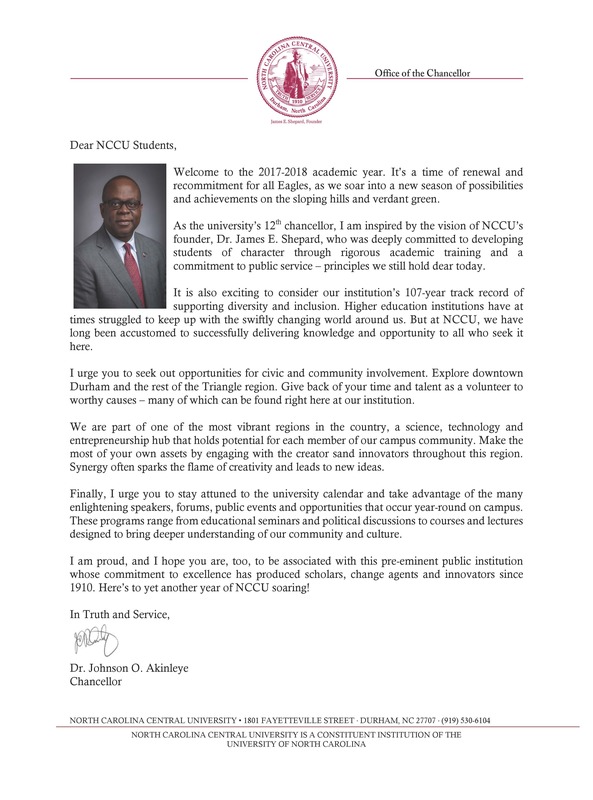 The School of Education is the academic unit responsible for all NCCU teacher education programs. Since its beginning, the University has prepared students to be teachers, providing them with a liberal arts education. Students who want to earn a teaching license, whether at the undergraduate or graduate level, must meet the program requirements in the teaching specialty area(s) and in professional education courses. In order for students to be admitted into the Teacher Education program ,they must have a cumulative GPA of 2.7 and other criteria required for admission. Students who do not have the required GPA will be given an action plan to bring the GPA up to 2.7 within 15 credit hours of course work designated by the program coordinator; after which, if the requirement is not met, the student will be denied admittance. Students who fail to be admitted one full semester prior to student teaching will not be able to take restricted upper-level courses or apply for student teaching. The program coordinator, informed by the advisor, will monitor the action plan. In order to continue in the program, students must maintain a GPA of 2.7. Students who fail to maintain the 2.7 GPA, and must have a 2.7 one full semester prior to student teaching to apply and be accepted for student teaching. The program coordinator, informed by the advisor, will monitor the action plan. In order to complete the program, students must have a minimum 2.7 GPA. A student who does not have a 2.7 cumulative GPA upon completion of student teaching will not be able to complete the program. The student must repeat the full student teaching component of the program, which will be determined by the program coordinator, university supervisor, and coordinator of clinical experiences. The program coordinator, informed by the advisor, will monitor the action plan. All candidates are expected to take specialty area exams, as required by NCDPI (Pearson and/ or Praxis II) and pass the exams prior to students teaching. Any candidate who does not pass the required exams will postpone student teaching until such time when the candidate can present passing scores to the program coordinator.